ETA: 29/04/19 This item is expected to arrive into our warehouse around 29/04/19. 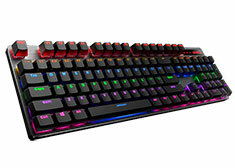 With RGB backlighting, aluminum alloy surface cover and spill-resistant design, the Rapoo V500PRO is a high precision tool for gamers that excels at FPS competitive gaming. With 60 million clicks per switch of guaranteed flawless performance, mechanical switches bring you the response and reliability you want.